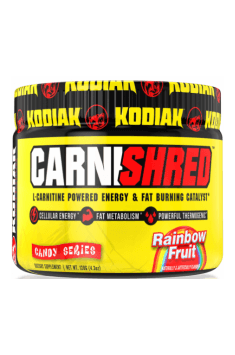 Kodiak CarniShred is a dietary supplement containing 750 mg of L-Carnitine tartrate, 500 mg of L-Carnitine fumarate, 25 mg of Aframomum melegueta extract , 20 mg of GBB-EEC, 2,5 mg of dihydrocapsiate, 5 mg of pyridoxine and 10 mg of pantothenic acid in one portion. L-Carnitine – is a non-protein amino acid responsible for transporting lipid to the inside of mitochondria in order to burn and utilize energy. Applying two forms – tartrate and fumarate aims at maximizing assimilability. Fumaric acid additionally takes part in Krebs cycle and the process of energy generation. Aframomum melegueta – a spice with an ingredient profile similar to ginger. It may accelerate metabolism by activating brown adipose tissue. GBB – ester chloride of ethylic gamma-aminobutyric acid and betaine. It is a precursor to l-carnitine, therefore may increase its endogenous production. CapsiAtra™ - dihydrocapsiate, a substance from the group of capsinoids. It activates sympathetic nervous system by activating TRPV1 receptors. It improves the sensitivity to insulin, intensifies thermogenesis and accelerates glycogen replenishment. In order to get rid of the stores of spare fat we not only have to release it from fat cells, but also make sure it finds the way to a proper place, where it will be transformed into utilizable energy. The process of burning fatty acids, also called beta-oxidation takes place in cellular power stations – mitochondria. In this process, the key role is played by l-carnitine. Fatty acids do not have the possibility of entering mitochondria by themselves, they have to be transported. And here the role of l-carnitine begins, which enables lipids to permeate via mitochondrial membrane. Burning fat results in the increase of useful energy in the form of ATP utilized, among others, to power muscle work during trainings. Contained in the preparation vitamins B5 (pantothenic acid) and B6 (pyridoxine) vividly participate in the processes of energetic transformations, supplementing the activity of other components. It is most reasonable to take l-carnitine and its precursors at the moment of the most intensive fatty acids release, i.e. during trainings, especially aerobic. Such a measure should positively influence the improvement of the effectiveness of the performed work. Apart from hated white adipose tissue, which is responsible for energy storage and rounding our silhouette’s shape, we also have brown fatty tissue that has incredible properties. This tissue may increase fat burning! Its dark color is a result of considerable mitochondria accumulation. The main function of this tissue is production of heat in colder conditions, therefore the exposure to cold is the main way if its activation. The curiosity is that animals which hibernate receive constant energy to survive and appropriate body temperature exactly thanks to brown tissue. For the people, who are not very enthusiastic about winter swimming or freezing showers there comes with help CarniShred. Contained there Aframomum melegueta extract exhibits the ability to increase the pace of metabolism thanks to its influence on brown adipose tissue. A pleasant additive to the product is the presence of dihydrocapsiate, which has a slightly different effect than other components. It accelerates metabolism by activating the nervous system and increased thermogenesis, similarly to capsaicin contained in chili peppers. Thanks to this property we receive a more complete effect of spare fat reduction. Kodiak CarniShred is recommended to the people during the period of fat reduction, especially those performing aerobic trainings in order to maximize the effects of their work. It is believed that with the increase in L-carnitine consumption increases the ratio of adipose tissue combustion. Unfortunately, this is not true. The use of L-carnitine is reasonable and brings benefits only by the deficiency of this compound in the body system. We need to add that using this substance during anaerobic exercise may significantly increase the use of fats as a source of energy. The use of L-carnitine is also reasonable if we aim at increasing systemic transformations which allow for extending the time of physical effort and improing its intensity. There are many different doses recommended for the supplementation with L-carnitine. The lowest recommended doses amount for about 500 mg per serving. However, they could be too low to cause any effects, so it is recommended to use minimum 1,000 mg per serving. The greatest effects can be achieved only by using 2–3 g a day. The majority of information sources indicate that the best time for the supplementation is just before training. It can be also taken with a meal. Numerous studies demonstrate that the greates effects can be achieved when using L-carnitine with a dose of 60–80 g of carbohydrates, which ensure its better absorption. We present the highest quality dietary supplements and sports accessories. The products we offer are a source of effective formulas that support any physical exercise. Our offer includes, among others, fat burners, anabolic substances, proteins, vitamins, as well as shakers and many more. The products offered are perfect for both beginners and more experienced athletes. The highest quality of our products and the customer satisfaction are guaranteed thanks to cooperation with the unquestioned leaders on the market in the production of nutrients and dietary supplements. Citric Acid, Natural and Artificial Flavors, Silicon Dioxide, Sucralose, Citric Acid, FD&C Red #40.